Synthetic peptide corresponding to Human Bax. WB: HEK293 whole cell lysate (ab7902), HeLa cell extracts. ICC/IF: A549 cells. IHC-P: Human lung carcinoma tissue. Human gallbladder tissue. ELISA: Primary cultured rat cortical neurons. Our Abpromise guarantee covers the use of ab53154 in the following tested applications. WB 1/500 - 1/1000. Detects a band of approximately 21 kDa (predicted molecular weight: 21 kDa). Immunofluorescence analysis of A549 (Human lung carcinoma cell line) cells, using ab53154 at 1/100 dilution. The picture on the right is treated with the synthesized peptide. Immunohistochemistry analysis of paraffin-embedded human lung carcinoma tissue, using ab53154 at 1/50 dilution. The picture on the right is treated with the synthesized peptide. ab53154 staining human normal gallbladder tissue. Staining is localized to cell membrane and cytoplasm. Left panel: ab53154 at 4 µg/ml. Right panel: Isotype control. Sections were stained using an automated system at room temperature. Sections were rehydrated and antigen retrieved with the EDTA pH 9.0. Slides were blocked in 3% H2O2, methanol for 10 minutes. They were then blocked for 10 minutes (containing casein 0.25% in PBS) then incubated with primary antibody for 20 minutes and detected for 30 minutes. Colorimetric detection was completed with diaminobenzidine for 5 minutes. Slides were counterstained with hematoxylin and coverslipped. Please note that for manual staining we recommend to optimize the primary antibody concentration and incubation time (overnight incubation), and amplification may be required. ELISA - Anti-Bax antibody (ab53154)Image from Adams SM et al., PLoS One. 2012;7(5):e37540. Epub 2012 May 22. Fig 3.; doi:10.1371/journal.pone.0037540; May 22, 2012, PLoS ONE 7(5): e37540. ELISA analysis of primary cultured rat cortical neurons, detecting Bax using ab53154. 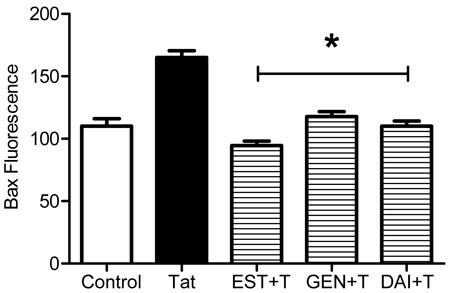 Cells were treated with (Tat) or without Tat (control) and either Estradiol, Genistein or Daidzein. Lysates were prepared after 24 hours. A 96-well plate was coated using carbonate coating buffer. 20 µg cell lysate was added to wells and incubated overnight at 4°C. Plates were blocked with 1% BSA for 2 hours at room temperature. Primary antibody (1/5000) was added to sample wells before incubating overnight at 4°C. A goat anti-rabbit ALP-conjugated IgG was used as secondary antibody and phosphatase substrate mixture was added. Absorbance was read at 650nm. Publishing research using ab53154? Please let us know so that we can cite the reference in this datasheet.